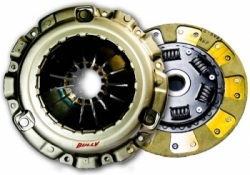 A dual friction disk that incorporates a steel back plated segmented kevlar facing on the pressure plate side while keeping the organic on the flywheel side, further increasing the torque capacity. Very popular with showroom, stock racing or touring cars where the engine output is within 40% of the OE offering. Clutch kits can only be returned if the incorrect part was shipped. Please keep in mind that 100% of all clutch kits that have been returned, have had absolutely no fitment or quality issues. The main issues we are finding with returns are improper installation, wrong part ordered, improper break-in procedure, and mechanic refuses to install any other clutch but the one purchased from him. For these reasons we ask that you research the parts and the installation process to ensure everything is correct. If your vehicle utilizes a Dual Mass Flywheel, please research to make sure your part does not require the flywheel to be changed. Any issues with installation, fitment, or quality should be brought to the attention of the manufacturer directly. All sales on clutch orders are final.